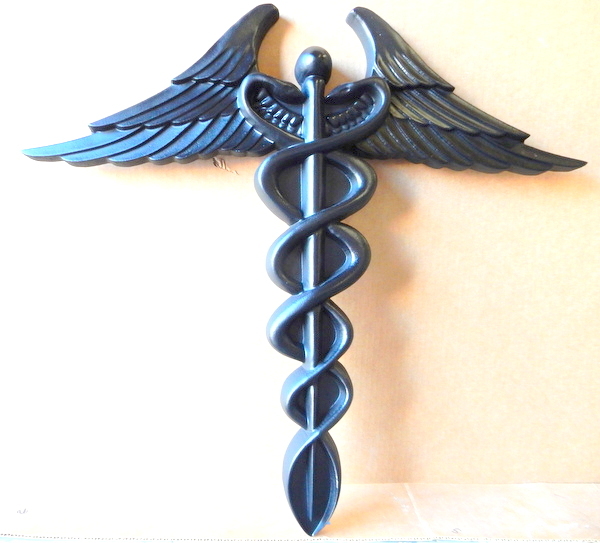 Above is shown a carved 3D caduceus symbol plaque for a Medical Office. This large wall plaque (3 ft high) is carved from High-Density-Urethane, given a hard coat of bronze metal and then clear-coated twice. This plaque can be used outdoors or indoors, and can be wall or sign mounted. More expensive design options is to guild the plaque with 24K gold-leaf, or fine silver leaf. It can also be coated with brass, copper, nickel-silver, aluminum, or stainless steel metal.To see many more photos of physician, medical and health care signs and plaques, including monument signs, click here Return to List. or on bottom right.